Cancellation is one of the great techniques in making calculations faster. This technique is used in simplifying fractions, rational expressions, and equations in Algebra. In this post, we are going to learn some of the cancellation techniques that are usually not in schools but can be a helpful strategy in taking examinations like the Civil Service Exam. Cancellation can be used to simplify fractions in order to convert them to lowest terms. In general, in order to simplify fractions, we have to get the greatest common denominator of the numerator and the denominator; however, making use of cancellation several times until the fraction is in lowest terms is also a good strategy especially for large numbers . In the first example above, cancellation is used to simplify 6/9 to 2/3 by dividing both the numerator and denominator by 3. In the second example, cancellation was used twice: first, 24/32 is divided by 4 to obtain 6/8, and then was divided by 2 to obtain 3/4. 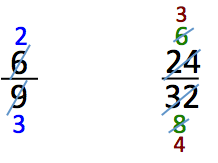 Cancellation can also be used to simplify multiplication of fractions. You can cancel any pair of number where one is on the numerator and the other is on the denominator. In the example above, 4/9 is multiplied by 3/16. (1) We can cancel out 3 and 9 by dividing both of them by 3. We get 1 in the numerator and 3 in the denominator. (2) We can also cancel out 4 and 16 by dividing both of them by 4. This gives us 1 and 4 respectively. (1) 9 and 15 are cancelled by dividing both of them by 3. This results to 3 and 5, respectively. (2) 4 and 8 are cancelled out by dividing both of them by 4. This results to 1 and 2, respectively. (3) 7 and 21 are cancelled out by dividing both of them by 7. This results to 1 and 3, respectively. (4) 3 and 3 are cancelled out by dividing both of them by 3. The result is 1. The examples above are discussed in the following video. The language used is mixed Tagalog and English. In the next post, we will discuss more about cancellation.